For a couple of years now I’ve set Runkeeper goals for myself, for walking, bicycling and swimming. This years I’ve switched from yearly to quarterly goals, to ensure I don’t end up like last year, having a huge backlog to deal with the last weeks of the year. Today was the last day for the goals of this quarter, and I got done with the bicycling goal a couple of weeks ago, so that’s not been an issue. The swimming hasn’t gone too well, I only went swimming once, so only 10% of that goal (1/10 km) got done. But I had a fair chance at the walking goal of 275 km, with a total of 13 km to go today to reach 100%. So all in all, I am very happy with myself. I got two out of three goals done. Yeah me! When I reached the biking goal I decided not to start a new challenge for myself over the summer, and I feel the same about the walking. I’ll pick up on goal-setting again in the fall, I think. Or maybe not… who knows? The TED Radio hour from NPR is great. I haven’t listened to the show for a while but figured it was time to provide a new flavor in my podcast recommendations. I love TED Talks, and have done for a long time. I’ve been watching them for years and years, and almost wonder if it can be as long as it seems, more than 8 years, I know that for a fact. And I also love getting a bit more depth to a TED Talk, and that’s what the TED Radio hour provides me with. The TED Radio hour on lies is very interesting to listen to. And interestingly enough, although I am a big fan of TED Talks, here’s a collection of five talks that were all new to me! They all center on understanding various aspects of why we lie, and I had more than one aha-moment while listening. For instance the realization that lying is a cooperative act. Now. I know I live in the experience of my thinking, but I just never really zoomed in with that understanding to the concept of lying before. So yeah, of course the power of a lie comes with someone believing it. That makes it really interesting though – am I sometimes more likely to believe a lie than not? Surely. Are there people who’s lies I tend to believe more often than others? I would think so. And when am I more prone to lying than not? What are the factors behind my own lies? Och allt jag gjorde var att försöka gnugga skärmen ren från avtrycket av barnafingrar…. 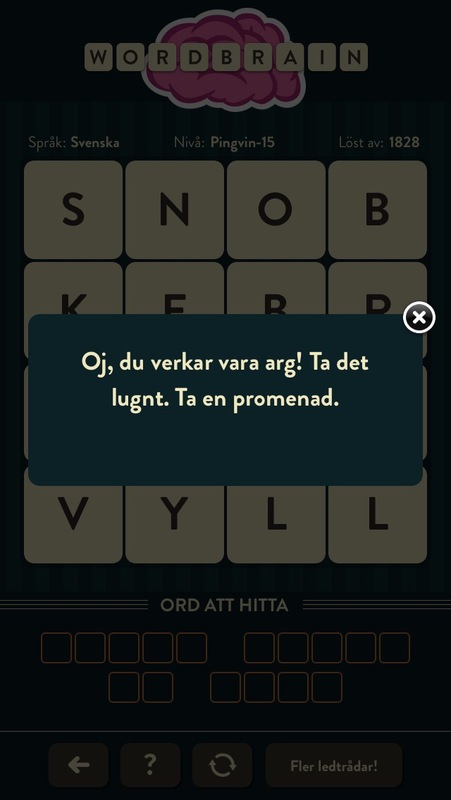 Jag föll i omedelbart asgarv, vilket måhända var Wordbrains syfte – misstänker det skulle bli dyrt för dem om frustrerade Wordbrainare slängt sina fånar i väggen när orden helt enkelt inte dyker upp. Är det månne anledningen till dessa små budskap, tror du?